Paris St Germain starlet Timothy Weah has explained the reasons around his decision to move to Scotland and join Celtic. Weah has scored his first goal for the club and looks to impress the team's supporters on a regular basis. Before moving to Scotland on loan, Weah explains that he was scared: "I was really scared coming to Celtic because I have heard so much about UK football being tough, the fans expect so much. 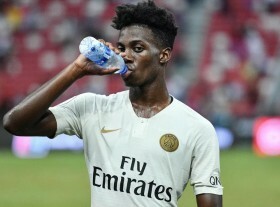 "I was always confident that I would get the hang of things but being young and inexperienced, you come here and there is a lot of expectation and I have to get going because the fans expect so much, coming from PSG and with the name that I have. 'The debut goal was awesome and I just want to score more goals for the fans and continue to help my team. 'There is literally nothing I can describe that's better than scoring at Celtic Park. 'I want to say thank you to my team-mates, they made me feel comfortable and gave me the confidence to go out there and do what I needed to do."